This particular publication is called La Brodeuse, a periodical published in France in the early 1900’s, featuring plenty of embroidery patterns. Somewhere, I have at least one original La Brodeuse pamphlet, sent to me by an antique-crazy fiend… I mean friend… who lives just outside Paris. (Thanks, Suzette!) I don’t know if it’s the same one, but one of these days, I suppose I’ll go bookshelf-diving to find out. 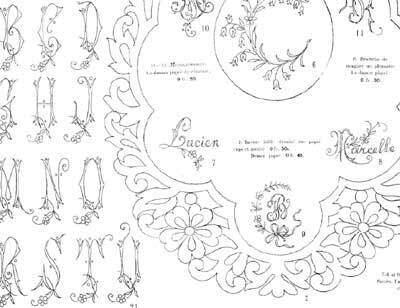 These publications are very similar to La Broderie Blanche, which is the publication from which the first monogram alphabet posted here on Needle ‘n Thread came. In the meantime, though, it’s there in electronic form on Antique Pattern Library for all to enjoy! You can download the PDF copy of La Brodeuse and save it to your computer for a ready resource. It isn’t too long (only six pages), so printing it out is an easy proposition, too. To enlarge the designs, a photocopier comes in handy. For tips and tricks on transferring designs, please visit my Tips and Tricks for Hand Embroidery list, where you’ll find a section on transferring patterns. I LOVE the Antique Pattern Library! So much inspiration. I am currently working my way through design's I like from Therese Dillmont's books, I just love the flowing Art Nouveau lines of her designs! I'm blogging my brother's wedding present project using one of them over at Su's Silks and Shinies. And wondering whether I should treat myself to some Mulberry Silks for the purpose, as it was pay day last week! Next Next post: Have you Tried Mulberry Silks for Embroidery?